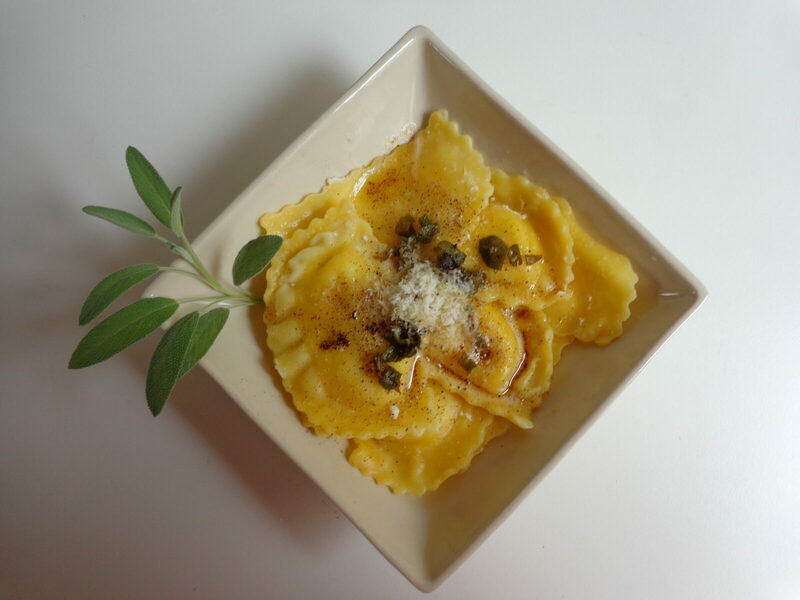 For this dish, any kind of cheese-filled pasta will do — square ravioli, crescent-shaped mezzaluna, etc. — as long as the filling is cheese and nothing else. Avoid combinations like ricotta-basil or gorgonzola-walnut, as such extra flavors will interfere with this recipe’s exquisite matching of sage, melted butter and parmesan. Cook the pasta in plenty of boiling water for just short of the time indicated on the packet. Drain thoroughly in a colander. Snip the sage crosswise into ribbons about 1/8 inch (50 mm) wide. Melt the butter in a skillet over a medium-high flame. When it is bubbly, scatter in the sage leaves. Allow to cook until the butter turns a nutty brown, about 1 minute. Gently add the drained pasta to reheat. Cook for 30 seconds, then flip and cook 30 seconds more. Season with salt and pepper. Serve in shallow bowls, pouring the sauce from the pan over the pasta. Scatter half of the grated parmesan on top — the rest may be passed around the table. Serves 3 as a starter, 2 as a main course. Thank you so much for your wonderful site! It’s easy to navigate and the dishes sound delish! I must confess, though, that I’m sitting here stewing just a bit. I’ve been duped! I believed the lies that French food is pretentious, expensive, difficult to prepare and that my kids wouldn’t eat it. And I also I believed that substituting fake, low fat, low calorie foods was truly the way to feed my family. I’m committing myself to change today and will begin feeding my family in the French manner immediately, beginning with raviolis a la sauge.